Botanical name [? ]: Hýptis lorentziána O. Hoffm. Hyptis lorentziana has been called "Hemigraphis traian" almost as long as it has been known in the hobby. However, characteristics of its flowers prove that it does not belong to the genus Hemigraphis ("traian" is an imaginary name) and not to the family of Acanthaceae, but to the family of labiates (Lamiaceae). Only recently (in late 2009) it was identified as Hyptis lorentziana. It has been imported from the Manaus area (Brazil), but is quite widely spread in South America (Venezuela to Uruguay and Argentine), and it is far more common in the southern parts of its area of distribution. It grown on the edges of ponds and other wet areas that are inundated regularly. In cultivation it grows to a moderate height, on its natural locations it may reach a height of approx. 2 m, and its rich inflorescence attracts a great number of bees. 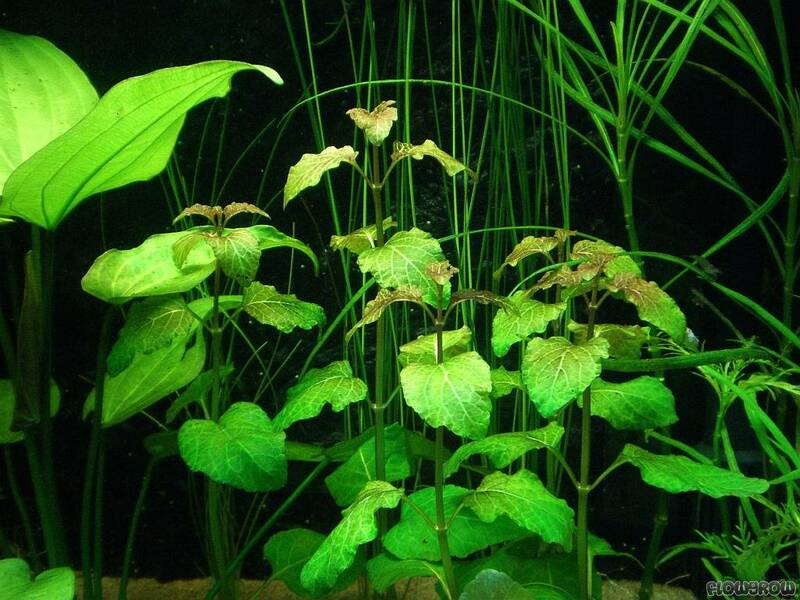 Unfortunately, Hyptis lorentziana is hardly available in trade these days, which makes it a rare aquarium plant. However, there is a growing number of hobbyists around the world who cultivate and propagate this beautiful plant and thus hopefully make it more readily available in the future. 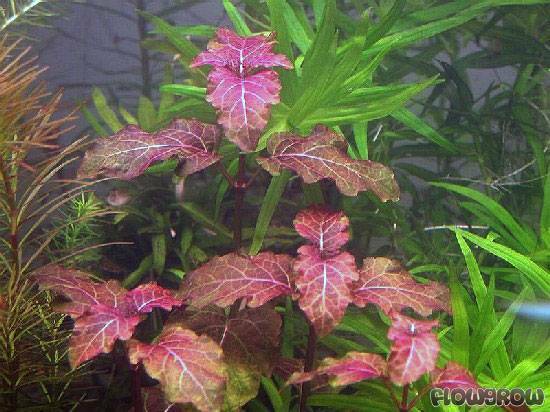 In Europe, though, H. lorentziana is hardly known as aquarium plant at all - yet. 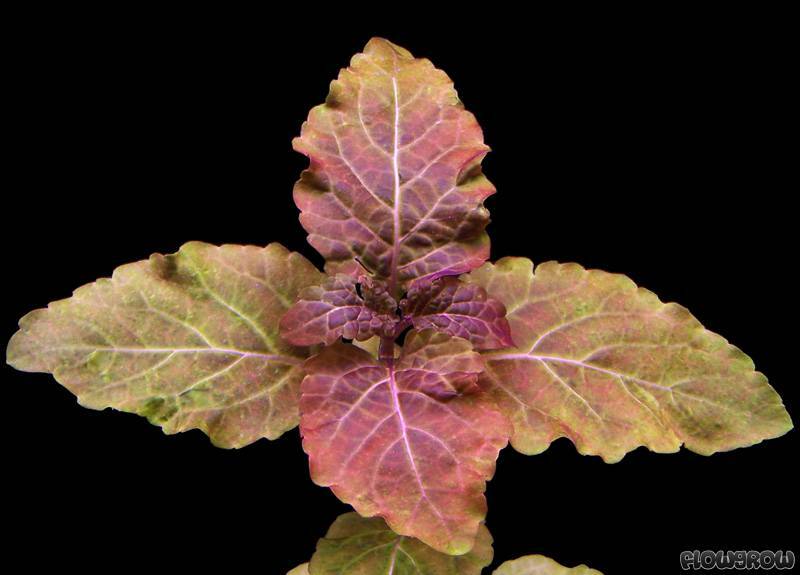 Under ideal growing conditions its petiolate leaves are of a deep red and grow in pairs along the stem. In the leaf axils, lateral shoots are formed. H. lorentziana does well under almost any water parameters, however, it needs strong lighting, CO2 injection and a regular supply of nutrients if you want it to display its beautiful purple-red colour (see photo). A nitrate level of around 10 mg/l contributes to intensive colours. In addition, phosphate ought to be a constant 1-2 mg/l. Under these conditions, H. lorentziana will grow strongly. Like other stem plants, H. lorentziana can be propagated through cuttings. These should be taken with a sharp pair of scissors directly above a leaf pair, around 8 to 10 cm over the ground. In addition, this procedure enhances lateral shoot formation on the old stem you can leave in the ground. Emersed cultivation is quite easy and leads to faster and often also to higher growth. The easiest way to get emersed stems is to just let the plant grow out of the water. If you cut the emersed stems and re-plant, they often start wilting a little. They need a few days to acclimatise. This problem can be remedied if you avoid unnecessary trimming and by keeping the cuttings in a closed yet roomy container with moist air. Its striking colour makes H. lorentziana a highly suitable accent plant for the background of a layout. 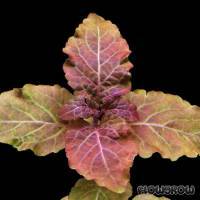 Its large purple-red leaves contrast beautifully against the manifold finer-leaved green plants available in the hobby.